Welcome back once more! How are you today? In the first part of this series I talked about how my business has grown and changed in the last few years. I answered questions on pricing and systems. In the second part, I answered questions about finding focus, creating routines and marketing schedules. You can find those posts here and here. Today I’m continuing the series, answering questions about growing your business. Keeping momentum and finding clients I think probably go together. Consistency is the common theme between the two, so stay consistent and stay clear on the benefits and what it is that you want to do and also the pricing you are charging. Ask yourself the same questions. Would I pay what I'm charging for this particular service? And if you would then chances are you maybe need to stretch up a little bit out of your comfort zone, go a little bit higher. If it's ‘no’ then chances are you're going to be attracting clients who also won’t pay that for it at that price. So, set yourself up in alignment with your own money ceiling to ensure that you know you are worth what you are charging and the value and the benefits that your clients will get for that, and knowing that value is really key. Keeping the momentum involves keeping up the momentum. Any work that you've been doing that gets great results, laser in on that and do more of it. Reach out to more people or spread the word in more places or just apply that consistency and allow it to level up. One of the things that excites me more than anything in my business is allowing people to see the change that is possible for them. I think sometimes that involves some, I’m not going to say a freebie necessarily, but a high value gift. That really for me, especially with the work that we do as coaches and in service-based businesses, that makes me so happy to be able to provide that for people. However, I totally get that sometimes that can be difficult then to start to move into talking about working or even that people may just get used to the freebie and that's the only time you see them or hear from them. I, personally, am good with that because everybody is at different stages in their readiness and their preparation to change and do the things they need to do to be able to change and I know that when people are ready to work with me, we will have built up a relationship based on trust and integrity that may have come from one of those freebies. You never know where the ripples end of the small pebbles you drop in the water. But one of the key things you can do is to really be clear on having a call to action whenever you have a freebie that you would like somebody to purchase or you know would benefit people to use and invest in. Make sure that you have a really powerful call to action somewhere in that. If it’s a thread, if it’s a video, if it’s a tutorial, if it's a masterclass or something like that, let's say you're doing it live in a group like I do with the intuitive threads and things, then you would maybe either in the post have an opportunity for people to be able to work with you. Because often people don't realise that that's what you do personally for them; they just think its something you do in the group! It's lovely having these threads and things, but often people don't connect the dots to realise that actually that's what you do for people in your work. They think it's fun and that's all it is. So make it clear that that is something you do for people one on one or in small groups and they can do it for this particular price. Another great call to action on a video or post would be to suggest people reach out to you privately to have a chat about working together. You could also set a time-limited freebie, or people limited. It also starts to set the really powerful boundary of people getting to know that what you gave away for free has an investment for you energy-wise, an exchange energy-wise as well. So they start to understand that expectation of you isn't something that just comes willy-nilly, so to speak. It is something you really honour and you hold in huge value when you give it away. Another alternative you could do is to the people who have maybe signed up with their email address to something that you're giving away free, then you could maybe have an email responder that then takes them through getting to know you and know what you do with an opportunity to invest in what you do to help them as well somewhere along the line. That's making it semi-automated. I think that's a good place to start - having a clear call to action, and I don't think you should ever be afraid of giving away your best stuff because it is helping people to get to know the magic you're able to create, they’re seeing a life change opportunity - feeling paradigm shifts, shifts in thinking, changes in their thoughts, their feelings, their emotions, and releasing stuff. And it gets people thinking, “What on earth can I do if I just worked with you for a little bit more, if I just spend some time one on one with you instead?” I think there are so many people who give away freebies and things like that but they almost hold back on the really powerful stuff so the people who are taking part in that freebie are just like, “Well, it wasn’t that good for me.” And it puts that kind of, “I don't know where to go next with it” thought into their mind. If you really give them the best you can give them as an opportunity, but with a clear boundary and a call to action to work with you afterwards, then they know what they need to do next if they want to and they liked what they experienced with that. Organising work-life balance - doing too much work for no remuneration. I think it's key, again, to look at where the non-negotiable work and life things have to happen, then being able to make sure that those non-negotiables are in. What then happens is you're able to then use flexible times to piece in where you need some you time, the work time needs to happen, and the extra life additional things need to happen as well. As you start to put those healthy boundaries in place, this is kind of like the masculine side, the masculine energy, then on those flexible things that's where the feminine energy comes in. So you can, on the day you know you’ve got an hour slot just for you, ask yourself “What would I like to do? What would I like to experience today?” It might just be sitting and chilling, having a cup of tea, it might be reading something in a book, or it may be going out for a walk or doing what makes you feel good. Also then if it's work you can plan that in a couple of days in advance or a week in advance around you're non-negotiables. I think the key thing is to work out how much you want to work and then start to build your work in around your life. On the clarity on the work, as you start to become aware of maybe having clear calls to action, opportunities to invite people to pay for what it is that you’re doing, the services that you're offering, or the things that you are writing, the projects you're on, you can also expand and automate the marketing work that you might be doing. So actually you're spreading the audience and making it bigger so potentially more people are getting their eyes on what it is you're able to offer them and do for them. If you're in any person-to-person business you've got to get comfortable with selling. This was something that I actually thought I was pretty okay with until I realised I really wasn't, about a year ago! As I've made peace with it and developed the belief that I AM ENOUGH, it has just transformed my business. Right from the get go, if I could give anybody any advice, it’s get really comfortable with talking about pricing, talking about follow-ups, talking about having boundaries in place so people know what to expect, and getting ready to take payments in advance of appointments and sessions. Because I think these are all things that I've struggled with so when I overcame them then it got really easy to be able to just grow and build momentum in my business with consistency. That has really helped me to be able to grow in my confidence, my visibility in my business, and also to believe in what I do. It's a powerful, positive cycle. This is what happens when you don’t have so many clients - you start to doubt your own abilities. You'll be incredible at what you do; we all are incredible at what we do in our own way. So, when you can really have the value in your own self-worth rather than relying on clients to provide that for you, or the number of clients, then you're able to really grow in your confidence, your own visibility, your own space to talk about sales and selling. Yes, there's a huge element of selling yourself but also there's a huge element of selling the benefit to the client or the customer, and I think that's key. There's huge power in being able to let them relate to how that’s going to work in their life - what it's going to provide for them and how it's going to work for them. Using social media to get clients is tricky and it's always changing. I'm no expert on the social media side of it but I am prepared to put money on the fact that if you focused on one particular one that’s really working for you rather than spreading yourself thinly over four, five, six, or seven platforms (unless you absolutely know what you’re doing!) you will see incredible success. Of course, you can do it organically or you can do it via paid ads on Facebook. I think you can even do it via LinkedIn now. Twitter does paid ads as well. You have to decide on what you’ve got to put into it, how you want to work your business - I personally love to connect with people, so organic feels amazing for me for now. Think about how you want to get more clients - what are your offers. From your offers, how might you attract those people who are aligned with your energy, but also with the words that you’re writing, the content that you’re putting out, the marketing that you’re doing on social media? Finally, what’s important to you as well? For me in my business, remaining intimately connected with people is really high on my level of importance. Using social media allows me to take time to get to know people better, to find out what’s going on for you in your world, and to be able to build relationships that way. This is because creating connections with others really make me feel fulfilled, I hope that the people I reach out to and the people I talk to within the group enjoy that as well - the community aspect of connecting. But similarly, you could put a paid ad out and have some amazing systems in place that will allow you to have more clients and you’ve never spoken to them once. It really does relate to how important those particular things are to you. a) Is it making you money? b) Are you okay with doing it? Because if something is making you money, but you are absolutely hating it, then there’s got to be that misalignment of energy which means that the things that you do want to do that will make you feel fulfilled are maybe becoming more constricted and restricted as a result of you not liking what you’re doing that is making you money. You may just need to just look where there may be out of alignment somewhere there. Also, when you start to look at what things to focus on to build passive incomes, focus on what it is that that thing can provide. There is absolutely no doubt that you could build passive income whilst doing so many things, but that will come down to time management which I’ve talked about already. As you up-level your life, health, business, income, there often comes a time when you need to slow down a little bit, so when you are wondering what to focus on, ask yourself, 'do I need to slow down, to move forwards?' Listen to the intuitive insights that come up when you ask what you need to do and that is where your focus needs to be, rather than keeping on pushing and giving yourself the opportunity to integrate that up-level that’s happening for you or in your business as well. When you are aligned with what’s important to you, what you’re enjoying, what feels fulfilling, and what is also making you money to the amount that you want to have, then that’s where you need to focus. Grab a pen and paper, sit down and figure out what’s giving you the best return on your energy, income-wise. When you can look at it like that, you can start to see objectively where you may be best putting your focus and applying your attention and your energy too. Also, allow yourself to, if currently the main income is from something you’re not enjoying so much, to inject some pleasure and joy into that to allow you to move into the expansive energy that will allow you to grow the bits that you do want to grow. I hope you’ve enjoyed this series on growing and aligning your business. I hope I’ve answered your questions. If not don’t hesitate to contact me. As you probably figured over the last three blogs, I am deeply passionate about seeing that you have the health, wealth, happiness and success you desire. 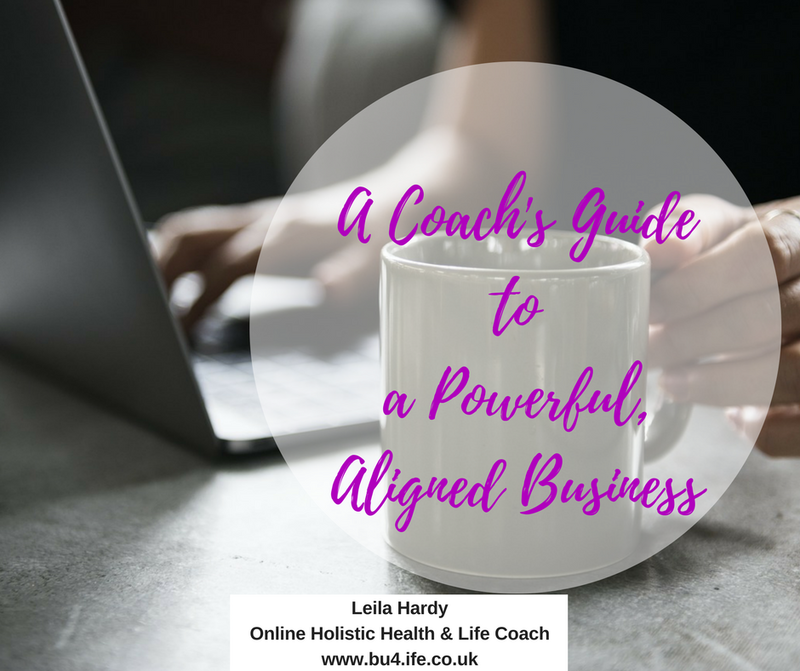 If you don't have that already and want to embark on a powerful journey to building the business you dream off, with the life you deserve, then reach out and book yourself a complimentary Clarity Call to see how, by working together, you can have all this, and even more!